Will utilizes a patented molecule to destroy chloramine and then removes the ammonia and chlorine. Gone are the days of hoping your biological filtration can remove the bound up ammonia before the health of your fish is impacted, a common process with most other ammonia removers. 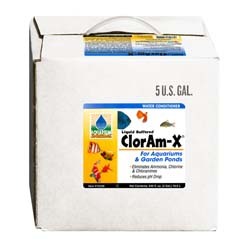 Look for the ClorAm-X® logo and USA patent number to prove you've chosen the leader in ammonia removal worldwide!